The Grumman Aircraft Engineering Corporation was filed as a business in New York on 5 December 1929, and opened its doors for business on 2 January 1930. Leroy R. Grumman, along with his partners: Leon A. Swirbul, E. Clint Towl, William T. Schwendler, and Ed Poor are considered the founders of the company. Grumman, Swirbul, and Schwendler all worked for the Loening Aircraft Engineering Corporation in New York City. When the Keystone Aircraft Corp. bought Loening, they moved it to Pennsylvania. Rather than leave their native New York, Grumman and his partners started their own company in a small abandoned auto garage in Baldwin, Long Island. Their first product was Floats for Navy scouting planes assigned to Cruisers and Battleships. These were Vought aircraft. So confident of their product, both Grumman and Swirbul took turns riding in these aircraft to guarantee their workmanship. Soon after, Grumman designed a fighter (FF-1) to meet the Navy's requirements for a new generation of fighters. The FF-1 was the first Navy fighter with retractable landing gear (Grumman designed) and fully enclosed cockpit. The company began to grow and moved to a new facility in Valley Stream, Long Island in 1932. But, soon realized they needed a bigger facility and once more moved to Farmingdale, Long Island just a year later. As production of Grumman aircraft increased, a final move was made to what was the potato fields at Bethpage in 1936. 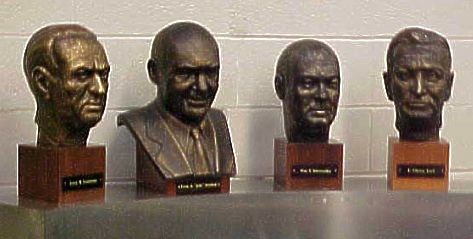 The founding fathers (from left to right): Leroy Grumman, Jake Swirbul, Bill Schwendler and Clint Towl. Production of Biplanes and Amphibians continued until W.W.II; then the company produced Wildcats, Hellcats, and Avengers. The Navy's need for more aircraft facilitated the need for subcontracting. Eastern Motors (General Motors aviation division) began making Wildcats and Avengers, while Bethpage concentrated on Hellcats. The Korean war saw Grumman's entry into the jet age with the F9F Panther. This aircraft was used extensively in Korea. 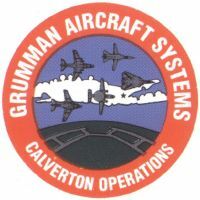 After W.W.II, with the dawn of the jet age, Grumman acquired use of the Navy facility in Calverton, Long Island in 1952 to manufacture and test jets. The Vietnam War saw the A-6 Intruder, the world's only All Weather Attack Bomber used by Navy and Marine Corps squadrons. The last days of the war saw the F-14, in it's first deployment with USS Enterprise, flying top cover during the evacuation of Saigon. During the US Apollo missions, Grumman built the Lunar Module. All LMs were produced in Bethpage and delivered to Cape Kennedy via a Super-Guppy aircraft right from Bethpage. Production of the last F-14 occurred in 1992. This began a steady decrease in business throughout the US aerospace industry. In 1994 the Northrop Corporation of California bought Grumman. Click here to find out more about the Grumman Museum!